But defender Bruno Ecoule Manga and striker Federico Macheda could return to the squad after recovering from injuries. Slade said one player had been forced to stay at home on Thursday and another was missing from training on Friday. ''We will give one or two others until noon tomorrow [Saturday] to see how they are. "If somebody is not in the building it is very difficult,'' he added. Cardiff are looking for their first Championship win of the campaign after three draws - having conceded a late equaliser in Tuesday's 1-1 draw at Blackburn. Asked when the lack of wins became a problem, Slade quipped: ''On the 8th of August [the start of the season]!" He added: "It was a really disappointed changing room at the end that we had not quite got over the line on Tuesday. "But we do feel, by and large, we are performing well. If we maintain that the win will be just around the corner, but the sooner we get it the better." Slade wants to acquire two players before the transfer window shuts on 1 September and underlined his desire to keep goalkeeper David Marshall and striker Kenwyne Jones. He played down fresh speculation linking Jones with former club Sheffield Wednesday and praised the club's stance in rebuffing West Bromwich Albion's approach for Marshall. 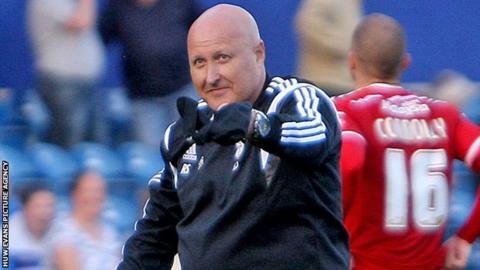 "Fair play to the owner [Vincent Tan] and Ken Choo [chief executive], they have stuck to their guns on that," Slade said. "West Brom initially came in and tried to pinch him [Marshall] on the cheap. That is not going to happen. I am not pointing at West Brom, but it is not going to happen." Slade said there had been "a little interest" in unsettled Spanish striker Javi Guerra. But triallist Romanian defender Gabriel Tamas was not at the club on Friday, having trained with the squad on Thursday.